It's my favorite time of year! I'm not out shopping right now. Are you? I'm scared of Black Friday here. I live in major tourist area so it's not only shopping traffic, but tourist traffic too. Nope! I'm staying inside. That being said, I'm ready to start the holiday cheer with a new to me indie brand. I came across Noodles Nail Polish holiday collection on Instagram a few weeks ago and knew I would be purchasing some of her pretties. I loved this collection so much and especially this color I'm showing you today. 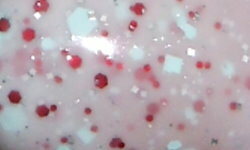 Peppermint Twist is a white crelly base with metallic red, metallic silver, and matte mint green glitters. Color: This is peppermint perfection! I love this color. What I love so much about this is how this isn't a simple red and white polish. I love the depth the mint and silver glitters give this along with the varying glitter shapes. I love this take on peppermint! Formula: This has a great formula. I used 3 coats above. This was so easy to apply and all the glitters spread out evenly on the nail. Overall: What a great polish to kick off the holiday season. I love this crelly glitter. The colors in this are great, it fits the name perfectly. The formula on this is great. I have no complaints, and I'm a definite customer of Noodles now! I think this is Top 25 of 2015 contender worthy!